…room number 15. Just as we entered I heard a thump and the sound of footsteps hurrying away. Somewhere a door slammed. “At least three of us can sit down here,” said one. There were only three possible choices. Leaning on the sacrificial tripod I was suddenly moved to say, “Perhaps these numbers relate to each other in some specific combination…” Immediately I regretted this act of charity…sometimes I think, after all these years, that I don’t really know myself. I revised my room 15 page and added WR’s solutions at the top. Some things there are better than others – goes without saying, I suppose. With the stuff on WR’s page and mine I think the room seems well covered. (Maybe overcovered in the case of one more complex solution I have on my page). I added Marianne’s U/V not as radio connection, but as a potential connection to U/V radiation and the sun (/svn). HA – one more 3 / 4 combo for my list. The guest that thought he had worked it out was proud of “himself” “him-self” 3-4. OK – this is a long one. I believe in many rooms we can do operations like in room 45, where groups of objects that are together are first assembled into something, and then the groups are assembled into something larger. Being directly across from each other can be a weaker form of grouping, as in 45. In 15 – the heroes and the helmet could be a soldier, but that is too easy, given the Greek military helmet. The next choice is fire-fighter. Across the room from that we have 4 sky objects. I can not think of any other way to combine the sky objects with that house picture except “smoke”. Putting these opposite side of the room things together, seems to give a common theme of fire. Next the bunny, the chair, and the hat. Hair seems to be the common denominator that fits best here. It would touch a hat, it rhymes with chair, and there is the hare/hair thing. We also have plenty of indicators of sun, from above, from the door, from “Apollo” which we’ve identified with the Tripod and Delphi. I think that might just tie the loose ends together here. I have some personal satisfaction in that I now think I understand why that hat is on the tripod ready to get torched. fire/hat fire/hair are both good “Helios/Apollo => sacred 7″ clues here in this “sun room”. (And “Helios” is even anther “H” for good measure). Re: “helios/apollo” It actually followed the real scientific method in an important way too. I got as far as “fire” from the 2 walls right and left, and had the “Delphi connection” to the tripod, and the “sun”, and I had the “hair” from the chair and things on it, and I made an internal prediction that if I looked for things associated with fire/hair/Apollo I’d find a seven. It turned out to be Helios actually, with the 7 rays of sun on his head, but pretty darn close. Noting the hat ready to be set on fire and that “Helios” was an “H” were after the fact discoveries. Point is good theories make predictions that can be confirmed. We can’t always do that here, but it’s nice if it happens. That’s it. Anyone got better than 3 of penticles? How about this? I’ve noted that the base is a triangular prism. And there really is no pentagram in the 3D structure, just a seeming one facing us. In the 3D structure there are 3 rectangular faces to the triangular prism. How about each face is cut into “4″ “tri”-angles? We are being clued to “overhead”: Hats/Helmet=over your head, sun overhead-high noon(note the shadow “under” the tripod), bird/cloud/moon/lightening=overhead, ceiling beams=overhead. A Three in the number over each door clues=(T): Greek Hero List:U & V clues. Heart back chair clue=shape. The word “thump” with a rabbit in the picture clues us to Thumper/Bambi Story=Thumper’s leg habit in the story which is the rabbit’s body part. Moving along to another rabbit’s body part, “rabbit ears’=”V” TV antenna, along with the tripod base with round top = “tower” TV antenna, these are two different “shaped” TV antennas-one V shaped(rabbit ears) & one tower shaped (tripod support with round top). The picture on the wall shows smoke “signals” over the house (not smoke from the house). The antennas are trying to attract the “overhead” TV UHF & VHF “signals” being beamed…making use of the U/V interchangeable letters we are being clued with. The visitors, the guide, and the rabbit are watching the picture on the wall (TV picture). I’m sure there is more to this line of interpretation-this is still a work in progress. Narrative: “Perhaps these numbers relate to each other”, 30+37+3=70=SEVENty with “three of us” & “three possible”=3…overall is Door #37. I’ve tried making a note of all conspicuously open doors and for some reason I always get derailed into noting other kinds of inter-room movement, like the cat in 4 and TopHat in 16; and then in rooms like 3 there are open doorways that don’t seem to have doors on them, but other doors that DO have doors on them, so do those count or what; and I end up just marking down every damn thing in the book. Let’s try again. I’ll note open doorways with no visible opened door only when other doorways in the room have doors. If we look at just the clear doors that could slam there are not as many as one would think. 10 rooms form V W’s list. 5 are false path leads. 2 are outside. 2 in the main loop. 1 in the trap. Besides 44 with a rope on the handle, 34 with Mr. yes is an obvious candidate. 15 and 34 have been mentioned in the past as having some linkages. I don’t think that exercise got anywhere much yet. How about building a chain of rooms. Maybe 34 > 15 > 44 for starters. Haha, I think I posted that in reply to the wrong comment, but we’re off and running now. 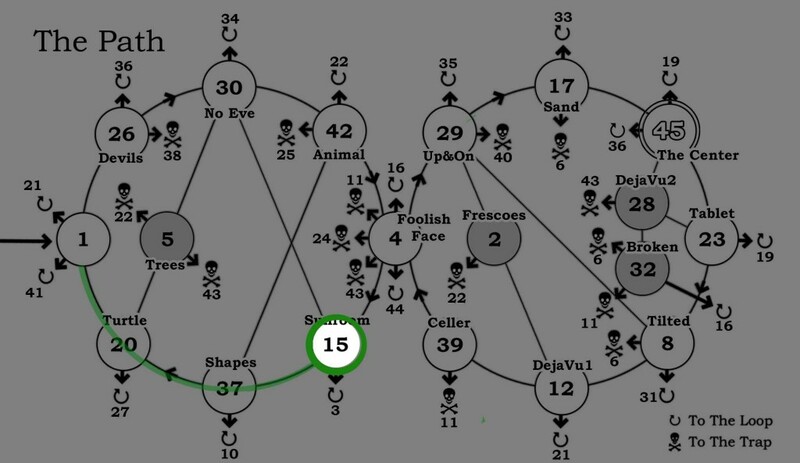 I don’t understand how 34–>15–>44 chain together, though. Or do you mean 34–[some other rooms]–15–[some other rooms]–44? I’m connecting 15 to 44 based on the slamming door and nothing else at the moment. I’m connecting 15 to 34 from memory that there were a lot of common things. The chair in the same position with “feet” vs. a chair with a bunny on it in the same position is the most obvious to me at the moment. Also maybe we have the “H” room and the “I” room. I know there were other reasons here too. Also – in 18 the door back to 44 (I believe) is labeled with a “G” clef. (And I think the little hand of the MAze clock is pointing at G in those outdoor rooms). Anyway – there is a potential – “G”, “H” , “I” sequence in that series of rooms 44 > 15 > 34. Although since WR has not set his clocks to MAZE time – the “G” bit is less likely to be in his notebook. For “G” in 44 – the rope that makes a 9 could also maybe be a G. For connecting 15/34 the seating comments are reversed – it seems 3 could sit down in 34, whereas if there are 4 in the group, why are “some” sitting on the floor there. The slamming door could also connect 15 to 34 too of course. OK – forget the “G”. We have “H” and “I” – the guide just wanted to say “HI”. There. done. I think the 3,1,3 – 3 works well. 37. But I still think 30 + 3 + 4 = 37. It would not be hard to intentionally design both to work. Just as we have Hs on the ceiling no doubt intentionally but also have an abundance of H words also intentional. 30 + 3 + 4 = 37 seems pretty good to me, maybe moreso than “three one three tripod.” Perhaps the text clue is there in fairness to those who didn’t arrive from Room 4 and couldn’t know that’s where the unmarked door came from. The 4 is tempting but unmarked door numbers cannot be part of riddles. All the information for the riddles of MAZE are self contained in each room with the exception of the Riddle of the Path, Riddle of the Guide and of course red herrings. I assume you are basing that on something Manson said, and not your take on Maze alone, but even so – that may be an overly literal interpretation of what he said to exclude “door 4″ on this basis. Particularly when there are a number of other 3 + 4 = 7 examples in the room I recall. On an unrelated note – in honor of this room reaching 5 points I may be inspired to update may page – at least room 15. Also – to others – notice that WR’s complete solution to room 15 includes nothing about the slamming door. This leads me to wonder if the open/closed door thing might be related to the guide. No luck on that path yet – but tossing it out there. I’m with you on the guide hunt. What room makes sense from here if we’re on the guide trail, though? 3 doesn’t seem to have anything left over. 37 doesn’t seem to. 30…probably not. We just came from 4, where it’s noted a cat is traversing the Maze, and then we’re hot on the heels of someone else. I’d hypothesize we’re hearing ourselves in another kind of time loop, but the thump and hurrying footsteps don’t seem to fit our group particularly well. This could be where the tortoise passes the hare, of course, but still, why the thump? Why the slam? Oh, wait, geez, is this supposed to be suggesting the rabbit jumped down and ran away as they entered? If that’s the case, the hare had to go through the open door to 3, right? And then somehow slam the door there shut? (The door in 3 from 15 is indeed shut.) Well, no wonder the tortoise beat it to the finish line! If so, this is interesting just as an indication of how the Maze works. The hare presumably wouldn’t slam a door; it must slam shut on its own after a traveler passes through. That actually makes a lot of sense in regard to the group being unable to retrace certain steps; why would they shut the doors on themselves? My thoughts have been that 44 is the slamming door ’cause i looks like it could be slammed by that rope. But I don’t know what to do with that. And I also tried trying to figure out how the guests moved through Maze. The take door B in room 1. But because of the open door in 25 to 35 they would circle the loop for ever. If I allow one “slammed door” here I can get them back to room 1 at least. But the path is full of closed doors that go the right way – so if they got there, they did not make it very far. And the Trap has no doors, except 11 to 24. Simply cataloging all open (closable) doors wold be my next step, I think. One way the slamming door could fit in is this: The riddle of the guide involves a chain of rooms. Somewhere on my page I have a candidate chain, but let’s assume it is not the one WR has. The slamming door could be a linkage in the chain between rooms 44 and 15. (The footsteps I still think are the cat from 4, and not related). Manson said that almost all links between rooms are red herrings. Those that are not red herrings are part of multi-room spanning puzzles. This leaves open the possibility that there are more multi-room spanning puzzles than the Riddle of the Path and the Riddle of the Guide – but (with two understandable exceptions) closes the possibility that information in adjacent rooms helps with room puzzles. I don’t know, Boss, this seems different from recurring objects or themes; the unmarked door from 4 isn’t a red herring, after all. Mmmm, not really…There is no standard constant for between-room clues/herrings, at least, not from the notes below. From what I can tell, that could mean the ringing sound heard in 1 and found in 20 or 26. I suppose the telephone and bell don’t really help us get to the next room. My problem with this is that even if they could, I don’t see the bell hinting to any particular room, and the telephone being next to 1, would be the correct door if almost finished the path. Last night on the Mazecast we talked about music being heard in 7 from 36, but didn’t mention that it is indeed the wrong way. The clues about the axe and hammer in room 39 pertaining to 4 are solid, they are not herrings. Because Manson confirmed the doll’s hair being made of yarn (I wouldn’t have believed it otherwise, and still don’t to some extent), I will still give it a poor review at the risk of being critical. I am still convinced of the ‘I Doll’ approach, or for those who don’t like that, the possibility that she is pointing to her ears in some kind of silence/noise paradigm that we have talked about before here (“the silences are just as important as the sounds”). I’ll keep looking for things that support this, but off the bat I can’t think of a chain of red herrings anywhere, really. I’m not sure I would even classify something as a red herring unless it lands you in the trap. I guess I am just a conflicted individual who doesn’t want to accept that these are loose puzzles up to interpretation. Ultimately the only solid Puzzle here is the 16-room Path. Everything else is up for grabs if you can convince someone of your theory! To be clear, I don’t mean that because the unmarked door, taken as part of this suggested solution, suggests the correct door it is therefore an intended clue. I just mean that unmarked doors in general don’t serve the purpose of red herrings, the unmarked door’s inclusion here is consistent with Manson’s policy of including unmarked doors from all incoming routes. 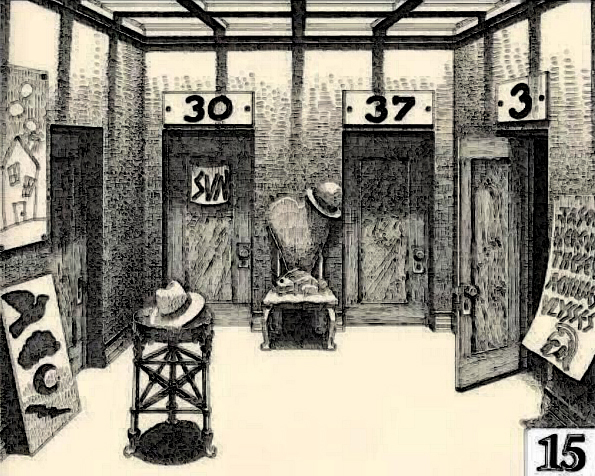 The 3+4+30=37 solution may not have been intended, but either way the unmarked door is not here as a red herring. Yeah – I don’t think that excludes 30 + 3 + 4 = 37 here. That really is not an inter-room linkage. The unlabeled door is here in this room. Yes of course you need knowledge acquired elsewhere to know that it leads to 4 but that it a rather technical point. If you are on the correct path you just came from 4, for example. A red-herring inter-room linkage in probably meaning something more like my connection between 34 and 15 which may lead nowhere (except spelling “HI” like on the floor of 1, if you like that). Hey, what about the broken key in 38? That HAS to be viewed in light of information from other rooms, right? In fact, using a mapping of other room connections in the Trap seems pretty similar to using knowledge of the path you’ve followed to note that the unmarked door in 15 comes from Room 4. I have a simple theory why so many the things refer to the sky: the rafters are made out of letter Hs. There are 37 triangles beneath the pedestal. A pentagram inside of a pentagon yields 35 triangles, and there are two more just above that. I don’t want to check your work here, but I hope you’re right! Back in the John Bailey days, I counted the triangles and got 37 and refused to double-check my count for fear that I would discover it was wrong. More recently I tried counting again and got a different answer, but I think I neglected to count the two triangles about the pentagram. If you’re right, I think you’re on very solid ground. Google agrees. Big “like” for me here. Looking into the 37 triangles with fingers crossed. That would be awesome! Okay, so my previous comment on the triangles was based on math, not counting, but I realized that the back leg of the pedestal bisects the pentagram. So it splits the topmost and bottommost triangles in half, adding two extra triangles. So the 37 is in the pentagon, no need to count the two above. At least in theory, every time I try to count I get lost! I may draw a diagram when I get some time. A pentagram does have 35 triangles but the bisection of the pentagram doesn’t add two triangles it pumps the number up to over 50. > There are two basic ways of dealing with the tripod, by imagining the actual object as if it were real, or by dealing with the flattened image as we see it (dealing with a flattened image raises one other issue the almost overlapping rungs create barely visible triangle slivers, do we count them?). > There are two basic ways of counting triangles, by counting only unbroken triangles (much simpler) or by counting every possible triangle even if it partially overlaps other triangles (a real challenge). The three dimensional object represented in illustration is of a tripod which has on each side a square made up of four triangles. The image is lined up so that it produces the image of a pentagram. I like that I apparently counted somewhat less than half of the possible triangles both times that I tried doing this. Well, before that is said, we do have some numbers stated in the text: “three,” “one”, “three,” which, ok, can give us 7. Some trouble: “15″ is also stated in the text, this being one of the rare rooms that is identified by number in the opening sentence fragment. Sorry, vewatkin I missed this post. Although this was the last approved solution that bumped the room up to five stars, 515′s “Hs in the rafters” suggestion was actually the more recently offered solution, so I’m going to rule (in my capacity as outgoing Cluemaster General) that 515 is the one who pushed this room into five stars, and he/she is therefore reigning Cluemaster! As a newcomer to the site, you may be unfamiliar with this very important and meaningless title I concocted and everyone, including my closest associates in the Maze business, has chosen to ignore. The way it works is that whoever the person is whose solution pushes a room up to five stars (points, circles, whatever; full solve-o-meter) becomes the CLUEMASTER until someone else pushes a room into five-star territory. This title carries no benefits, not even respect from your peers, but it’s so impressive-sounding that it’s essentially its own reward. Totally psyched, I will do my best to carry out my zero responsibilities for as long as I reign. Sorry, I think I made a mistake. Retract that last comment. There’s ten and three. My coffee hadn’t kicked in yet. The text gives the answer as “three” and “seven” or 37. Simple. “Arguably the most famous prediction in history is the one concerning the fate of Julius Caesar, made by the see Vestricius Spurinna: ‘Beware the Ides of March.’ This warning was made in 44 BC.” from google. Hmm…so far a “rabbit hole” lol. And maybe that is all it is. Er…well as noted in 7 we should be looking for Alice stuff. We have a bunny here. Not a white rabbit (we never did try to see if we could fit the song). Bu a Hare. A March hare? March “15″ is Ides of March. Not sure this is really getting to anything. Just noting connections. The time in 34 GF and here it is EG. Events that are two MAZE clock cycles apart are simultaneous. So in some sense room 34 events happen first, because the time is “xF” and events here happen next because the time is “xG” so there the door is open and here we hear it slam. Actually that is a bit mixed up. Between the house and the heroes, seven pins/nails/tacks (whatever holds up the posters) on the map. On a more SERIOUS note, there’s this relationship between things in the sky that we’ve connected a hundred different ways so far. I’m not sure how convincingly we’ve tied that altogether–so let’s do it AGAIN. No, I don’t really have a solution here, just trying to bring those circular smoke clouds into the mix by comparing them to the darkened zero on door 30, but I don’t even have the strength anymore to just shake up a bunch of threes and sevens and make 37. I jokingly suggested the truth-telling hats before, but maybe’s it’s just the hat sitting on the tripod connecting to the hat pointing to the darkened 3 in 37? See, anything we do here is going to seem stupid, because we already HAVE 37, and we’re doing all these operation to make it 37 again after blacking out the three, but the thing is, there’s a bit of symmetry in doing it this way. The darkened sky images clue us to look at shadows from the ceiling and, maybe, fill them in with sky images? Like, 30′s 0 is blacked out, and there’s the SUN on the door, that doubles as SEVEN, and we stick it in the blank to get 37. Man, I know, this is like two degrees off from things said before. I’m just trying to tie some elements together a little better. Mission failed. One hat sits on TRIpod. Other points at 7. And one on Tripod points at 3 clouds. You may be right about the two-hats solution there; I’m a little divided about whether you can say the one hat is pointing at the 7, as opposed to 37 as a whole. I don’t think the other hat is pointing at the clouds either. In fact, I think the clouds may be a false clue for 30: a series of three Os. That may be why the picture is touched by the shadows: to cancel it out, like the 0 and 3 on the other wall. Note that the other written clues we rely on (the heroes poster, the sky images poster) are located low enough that the shadows don’t reach them. Yeah – OK – the Tripod hat points at the upper right tack, which is nothing. The other one is right at 7 though I think. I’ve also concluded there are 2 incomplete Trinities here, as if you needed more fakes at 3. But really if the Trinities WERE complete that would be too strong an indicator for 3 particularly given all the other 3 stuff. But all the 3s can in one way or another be connected with a 7 except the “sitting” clues, so the 3 bunny legs are the only complete fake 3, I think. The dove is both HOPE and it is HOLY SPIRIT. (2 more Hs too). Charity is part of a puzzle, and so is SUN/Son. “Father” is missing. So is “Faith”. But then my Room level solution is “Fire Fighters” so too missing “F”s sort of fits with that. Explanations for “At least three of us can sit down here”. 1) Directs attention to the floor. Sure, maybe, but not enough to explain this. 3) The bunny shows 3 feet. Intended I’m sure. But not a complete explanation either.
?) Spider sense says there is more…but maybe not right here. Where in MAZE can 3 people sit please? Betting there is a tie in where ever that is. 29 – exactly 3 empty seats! 35 – broken couch (3 seater missing one cushion) and bench. Not much luck in 29. Staves are tarot and so is penticle. Blind guy might be Masonic tiny tie to here. 7 read up here, upside down there. Nothing important. But…maybe 34. There there are 3 comfy sitting places and it talks of people sitting on the floor. Yeah – 34 also has man in door, and 15 we hear door slam. Odd leg chair is in same position as bunny chair. Somethings up…. Seven legs on chair in 34. But that is a long way to go to get just another 7. On the other hand – it would make each and every 3 in 15 tie in with a 7 somehow someway. I suspect the extra hat in 15 is related to the unseen person that you hear leaving when you enter. I think it’s Mr. Yes, and he has left his hat behind. Hey, here’s an interesting thing that I don’t know how we missed before. We’ve mused about this “three of us can sit down here” line, and I suggested earlier that it’s a(nother lousy) thing about counting legs, because there are three legs on the chair (the rabbit’s) and seven legs on the ground. Well, there are three Us (Vs) on the heroes poster. Do with that what you will. It might go with the SEVEN spelled up in the poster, it might provide a counterpart to the SVN sign on the door to Room 30, it might just be another 3 thing tossed into the room. S 5.7% E 11.1% U+V 4.6% E 11.1% N 6.6%. Then I assumed 7 letter word lengths and random distribution based on those frequencies to get the probability that a random 7 letter word contains at least one of the letter in question. I got E 56%, S 33%, U/V 28%, N 37%, E 56%. Now multiply these probabilities and take into account the word could read up or down. 2.3% chance of random occurance. If we use Bayes’s formula with the statinf assumption that we think it is 50/50 weather be intended it of not, then the result is 97.8% chance of intentionality. So this is a perfect reference example – this is what a “Too Close Too Call” case really looks like. We also might get a 7 from the House by itself. 2 windows, 1 door, 1 chimney, and 3 clouds, makes 7 details. Room 15 is now up to date on my page. Vote for adding pleathora of 4+3=7 solutions to board here. I’m hoping one of my little 4 3 combos has to do with Ravens last point. I have a room solution puzzle but not a real satisfying one unless something more comes up. The 4 symbols mentioned are sky things. Add this to the house picture and common denominator is smoke. The hat on the altar will give you fire. Fire and smoke is promising. Sun just reinforces fire. Add the hare and chair and get air and the a hat could suggest wind and now we have wind and fire and smokes. In that context the heroes would be fire fighters. That uses the room but seems pointless. The best I have is that in the next room 37 we should climb the ladder. And unless something better shows up I’ll go with that. Light from Heaven above fits the theme. And rhymes with seven. But…still sort of need a point here. Why bother to put the trinity here, if indeed it is here. Many 7/11 stores are run by people descended of Indian lineage. India was the 37th country to join the United Nations. Boom, solved. Give us the puzzle points, WR, give us all the points. Another problem with the trinity concept besides that it does not go anywhere is that is does not rely on visual groupings. Yes the dove is a perfect symbol of the holy spirit but it is just one of a group of 4 items. So it’s still coincidence unless something more brings it together. It would be silly except for the bit about 3 sitting but only one chair. No crystal clear father either. Ok so putting that one down unless something else comes up. Can we still do something with pentacle? Correction 3 of penticles is master craftsman. The symbols on the sign all represent days of the week. The lion’s mane is the symbol of Tyr, tamer of wild beasts, namesake of Tuesday. How about trinity as a red herring for 3? Rather complex for that. herrings should be simple. unless you think the 3 in one chair is simple Trinity reference. Vague support in the room but nothing to bring it together. yeah – for now I’m going with trinity hint as a more elaborate than normal red herring. Unless/until I see something better. Never heard of dove odin thing. Not immediate hit on Google. That’s a cloud. Not a lions mane. And 3 IS the worst door choice and the one conveniently open for us. Maybe thumped there made the thump. As the sound of the cats footsteps from 4 hurried away. The door slammed might just be the one back to 4. “Three possible chooses” highlights the 4th impossible choise room 4. Here is a partial. The hare/hair with the hat is “head” so we have head and heart there. This is a 3h room. 4h group is a “charity” motto involves “heart,head,hands,health ” tripod feet vaguely resemble their symbol. Oh and head/heart could also be in helmet/heroes. Less clear there. The hard/hat/heart/hat on tripod gives 4 Hs. And the tripod brings sacrifice/charity in to the mix. So 4H group is there. Hands on the tripod perhaps. Along with head and heart previously mentioned. Not seeing health spelled out unless that is wearing a hat in the Sun. Oh and 4H groups plus TRIpod gives 7 I suppose. But really 3 from anywhere. 7 is important bit. Ceiling has 4 rows of lights separated by 3 dividers. Another 7. Man I am going to have to do some typing on my page. Some room progress going on today. Some other things: the house has 3 Windows and 3 puffs. It is held on with 4 tacks and the sign below it has 4 items. 3+4=7. The tripod shows us a star. But the 3 dimensional shape of that network is a triangular prism. The faces are triangles and rectangles. 3 edge figures and 4 edge figures.